In Berlin, President Emmanuel Macron of France renews the call for Europe to do more for its own defense and security, saying the continent cannot “become of plaything of great powers,” days after he irked the US by urging the formation of an independent European army. According to Press TV, in an address on Sunday to the German parliament (Bundestang) in the capital, Berlin, Macron asked Chancellor Angela Merkel to support a range of reforms to strengthen the European Union (EU), saying it was up to France and Germany to help build a more sovereign and efficient Europe fit for the future. He also urged pro-EU forces in the continent to take concrete policy steps in a bid to fend off anti-immigrant, nationalist parties on the rise in several member states. 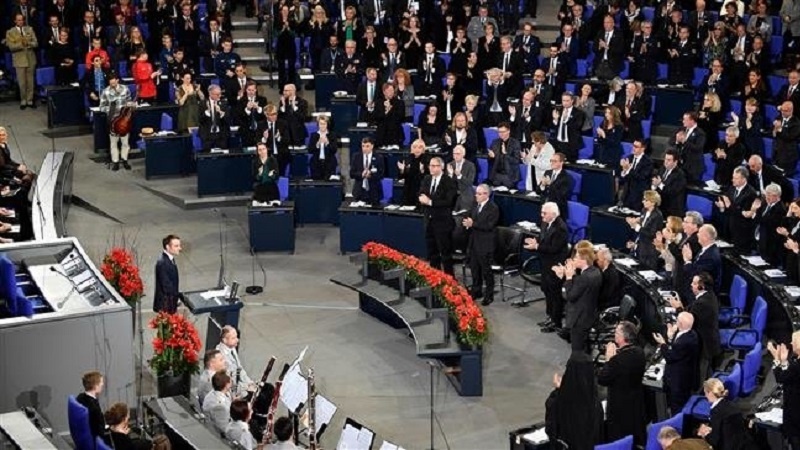 Macron – who was in Berlin to take part in Germany’s national Remembrance Day for the victims of war and dictatorship – also held talks with German Chancellor Angela Merkel on a range of issues, including migration, fixing the euro, Europe’s defense and taxing digital companies. In an idea warmly supported by Merkel, Macron said last week that Europe needed a real army to reduce reliance on the United States for defense, drawing a fusillade of angry tweets by US President Donald Trump.